What happens when we increase the number of slits in Young’s experiment? In that case we create something called a diffraction grating. Again, we can think of the diffraction grating as being the same as a set of sound sources which are all coherent with each other. We now have a case where there are many more than just two sources interfering. The simulation below shows the sound field generated by a set of sources. Do we just get a chaotic mess? Are there still quiet and loud patches – Young’s fringes? We don’t just end up with a chaotic mess – because the sound sources are coherent. So we still get loud spots where the sound from the slits arrives in-phase, and quiet spots where the sound from the slits cancels due to destructive interference. 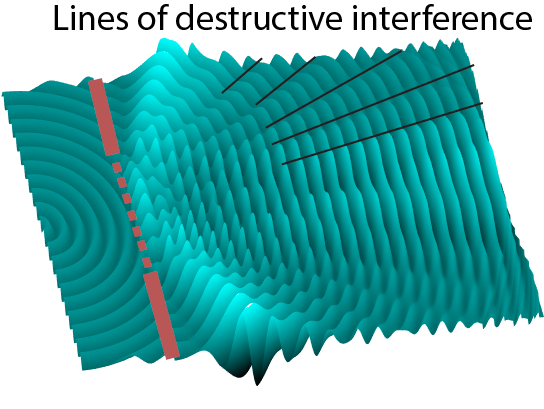 In the diagram below some of the lines of destructive interference have been marked. Between those you get constructive interference and a louder sound. As with Young’s double slits, the directions of the fringes can be calculated. 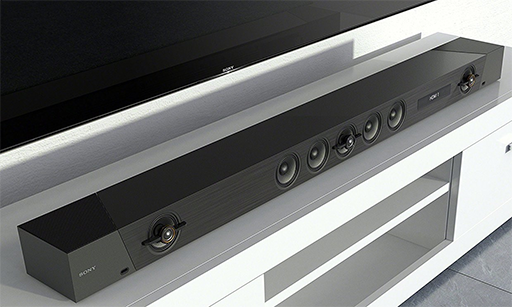 In acoustics, a common example of many sources side-by-side is a soundbar. These are a set of loudspeakers side-by-side. Here the designer makes use of the interference pattern to ensure that sound beams towards the people sat on the couch in front of the TV. Less sound is sent to the sides, reducing reflections from the room and so helping the TV sound to be clearer. 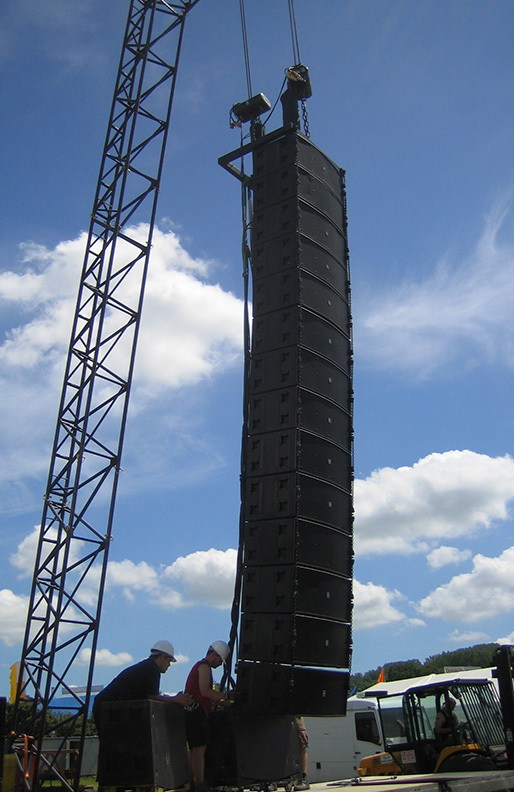 In large PA systems for outdoor gigs, a similar arrangement is popular. Modular speaker boxes are sat one on top of another in a tall pile, or hung from a suspending gantry. This is called a line array, and follows the same idea. The sound is directed broadly in the plane of the audience’s heads – but forms a tight beam in the vertical plane. This means that if the line array is angled slightly towards the ground, the audience can enjoy high-volume music – but that the spread of this music to surrounding houses etc is controlled by the line array directivity. Trying to control noise pollution is one of the major problems you have to overcome if you want to run a music festival. Unless you can persuade your audience to travel somewhere really remote, you risk annoying the neighbours, and without proper acoustic design that can get you shut down! Let’s come back indoors and think about the many different types of buildings which need to have special acoustic design. In concert halls, recording studios for music, TV and radio, and even class-rooms we need to control the amount of sound reflected from the walls, floor and ceiling. These reflections disturb the original sound and cause unwanted echoes and reverberation. In concert halls and classrooms these echoes mean that the original sound can become difficult to hear properly – there can be poor intelligibility. Try this experiment – go into a small bare room like a bathroom and make noise – a handclap will do. The direct sound arriving at your ears directly from your hands is quickly followed by reflections from the walls, ceiling and floor. These reflections can cause the sound to be coloured, or to put it another way, the timbre of the sound will change. (Timbre is a French word which describes sound quality). The diagram below shows a plan view of a small rectangular room, highlighting a first order (involving only one reflecting surface) reflection from the top wall in red. In small rooms, first order reflections tend to be loud and arrive very soon after the direct sound. You can imagine the waves bouncing around like balls on a pool table. Second order reflections are like shots played off two cushions, third order off three etc etc. The higher-order the reflection, the further the wave has travelled and the later they arrive. These later reflections all blend in together, and cause reverberation. There are two basic forms of acoustic treatment to deal with reflections, namely absorption and diffusion. 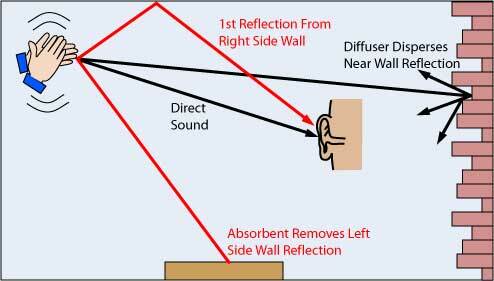 One solution to reflections is to apply absorption to the wall, which turns acoustic energy into heat – this is a kind of damping. This absorption can be a specialist product such as those made of mineral wool, open cell foam, or recycled fibrous material like paper-waste, but absorption can also be provided by more commonplace object such as curtains, sofas or carpets. 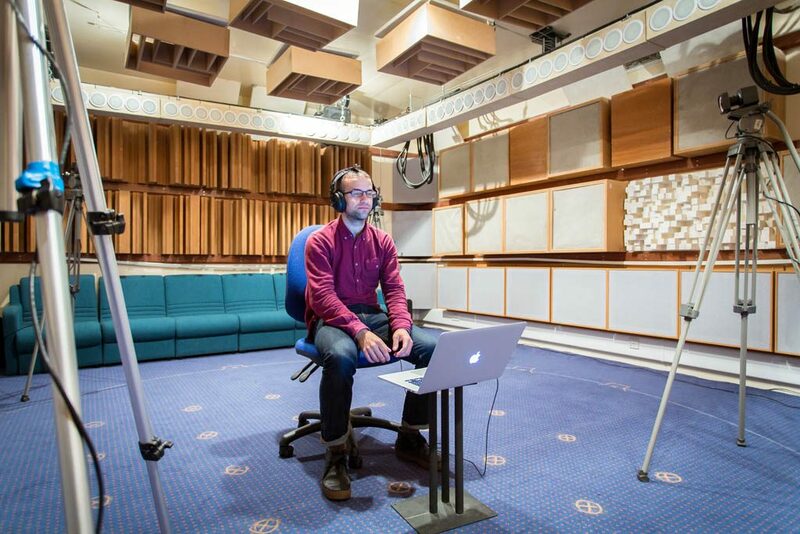 It can be a tricky balance for an acoustic designer – too much absorption, and the room will sound dead. The sound quality would be like listening outdoors, where only the direct sound from a source is heard (assuming soft ground and an absence of nearby buildings). Acoustic Diffusers are used to disperse reflections spatially – to spread out reflected sound energy over a wide range of angles – as shown in the diagram above with the black path. Some diffusion can be obtained by carefully placing book cases and other furniture in a room, but often specialist (=expensive!) diffusing surfaces can achieve greater diffusion in a more controlled manner. By using sound diffusers, first order reflections are dispersed to be heard later by the listener, and by removing and delaying early reflections, diffusion and absorption can make a small music studio sound like a larger room. Consequently, design is all about locating the reflection points for first order reflections, and applying appropriate treatment there. An extreme example is shown in the listening room photo below.